VietNamNet Bridge – Vietnam-Laos friendship is proven very clearly at the Prince Souphanouvong (late Lao President) Museum in Vientiane, Laos. 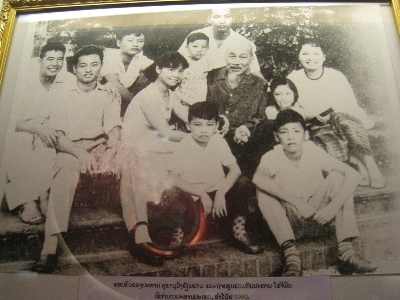 President Ho Chi Minh took photo with Ms. Ky Nam and her children. The most respected memories of late President, Prince Souphanouvong are related to President Ho Chi Minh and Vietnam. The first photo that Prince Souphanouvong taken with President Ho Chi Minh is placed next to pictures of the prince’s family. That is the picture which was shot on September 4, 1945. After the August Revolution, Prince Souphanouvong was a bridge-road engineer and was working in Vietnam’s Vinh City when he was requested by his brother to come back home to take care state affairs. According to Mr. To Huy Rua, head of the Central Party Organization Committee, President Ho Chi Minh invited Prince Souphanouvong to Hanoi to discuss alliance between Vietnam and Laos. That historical meeting was the turning point in the history of Vietnam-Laos relationships. Prince Souphanouvong joined the Indochina Communist Party and began his revolutionary career. According to the museum’s guide, in that meeting, President Ho Chi Minh and Prince Souphanouvong agreed with each other about many important issues related to the two countries. President Ho invited the prince and his wife, Ms. Nguyen Thi Ky Nam, a Vietnamese, to have meal with him. The meal only had fish, salted shredded meat and boiled spinach with soybean jam. Perhaps after this meeting, Prince Souphanouvong turned from a prince, a patriotic intellectual into a revolutionist and then a communist. Four years later, in 1949, Prince Souphanouvong returned to Vietnam to see President Ho in Tuyen Quang province. The museum used to be the house of Prince Souphanouvong. On the second floor, there is a small living room and two workrooms of the princess and his wife. The workroom of Prince Souphanouvong is simply decorated, with a rattan-made table and chairs, some bookcase and a cabinet. On the cabinet top is the portrait of President Ho, a censor and a pair of candlesticks. The workroom of Ms. Ky Nam is simpler. On her bookcase is a small statue of Trung sisters, Vietnamese heroines. Many photos featuring Prince Souphanouvong or his family with President Ho and Vietnamese leaders like Ton Duc Thang, Le Duan, Pham Van Dong and Vo Nguyen Giap. In a visit to Ms. Thongvin, the wife of former Lao President Kayson Phomvihan, together with a delegation of the Ho Chi Minh Youth Union, I saw a photo of Mr. Kayson and President Ho in her living room. 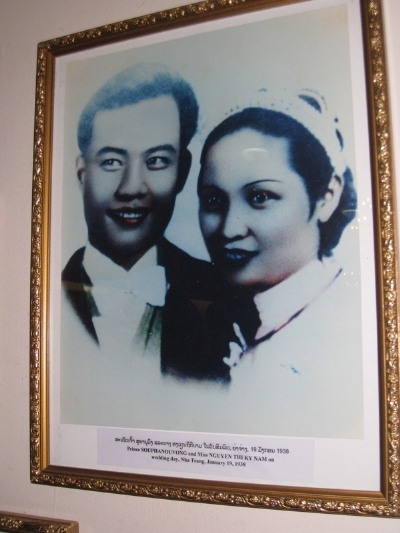 Prince Souphanouvong and his Vietnamese wife, Ms. Ky Nam. “The solidarity between Vietnam and Laos is the one in this world. Prince Souphanouvong said: we have many strategic friends but nobody is better than the friend who fights in the same trench with us. There are many relations but the relations between Vietnam and Laos is always more special than others because we share the same trench,” he added. General Saman Vignaket is called the ideologist of the Lao People’s Revolutionary Party. He was born in Thailand and worked for a Vietnamese family in Thailand when he as a boy. This family adopted him and gave him a Vietnamese name “Duc”. He joined the army led by Kayson Phomvihan. Thanks to the deep affection between the two countries, many Lao and Vietnamese become husband and wife. Prince Souphanouvong and his wife, Ms. Ky Nam is an example. At the age of 11, prince Souphanouvong was sent to Hanoi to study at the Albert Sarraut School. After that, he went to France to study at the Paris Civil Engineering University. He was the first civil engineer in Indochina. Returning to Indochina, prince Souphanouvong worked in central Vietnam, at important positions like the chief architect of Nha Trang, chief technician of the civil engineering department of central Vietnam. He designed and observed the construction of many irrigation works in Vietnam. Seven of them are still used today. Phan Thiet water tower, designed by the prince, is praised by experts as a beautiful and the most unique water tower in Vietnam. It has become an official symbol of the central province of Binh Thuan. He also built Yen Xuan Bridge across the Ca River, Do Luong, Thanh Chuong and Bai Thuong dams in central Vietnam. Bai Thuong dam, which is 160m long, 23.5m high, supplies water for more than 50,000 hectares of fields. It used to be a tourist attraction and was printed on stamps. Working in Vietnam, the prince got married with Ms. Ky Nam, a girl from central Vietnam. Someone said that Ms. Ky Nam is a cousin of Vietnam’s last King Bao Dai. When the prince was appointed as the chief architect of Nha Trang, he hired a hotel room in Nha Trang, where he met with Ms. Ky Nam, a schoolgirl of Dong Khanh High School in Hue city, who returned home during a summer vacation. The same year, Ms. Ky Nam was crowned Miss Central Vietnam. They got married on January 19, 1938. Their honeymoon was a trip along rivers in central Vietnam. Ms. Ky Nam had a Lao name – Viengkham. She became the deputy director of the Lao Institute for Social Sciences. There is a photo of the couple, taken in 1972. They still looked young and happy like in the wedding photo they took 34 years ago. They had 10 children, including eight sons and two daughters. There is also a picture featuring Ms. Ky Nam, her children, with President Ho. During the visit of the delegation of the Ho Chi Minh Youth Union to Laos, we met with Dr. Kongkeo Xaysongkham, Vice Party Secretary and Chair of Bolikhamxay province. We paid a visit to his home on the way to Vientiane. 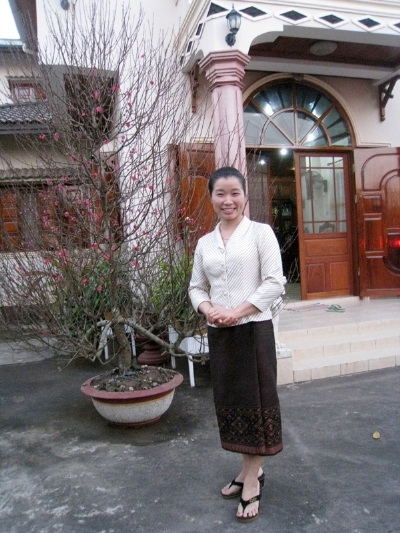 Dr. Kongkeo’s wife is Ms. Ngoc Anh, a Hanoian. Ngoc Anh felt in love with Kongkeo, a Lao student at the Hanoi Transport University, and then they got married. (Dr. Khampha Phimason, who studied at the National Economics University in Hanoi also got married with a Hanoi girl. This is also similar to many other Lao-Vietnam families). Asking Ms. Ngoc Anh about their love story, she only smiled and said perhaps it was their destiny. Several days later, some people in Vientiane, who knew clearly about the couple, said that Mr. Kongkeo attended a wedding near Ngoc Anh’s home and their love was at the first sight. They now have two children, a son and a daughter. Receiving Vietnamese newspapers as gifts from the first secretary of the Ho Chi Minh Youth Union, Ms. Ngoc Anh said that these were valuable spiritual gifts and added that her children can speak Vietnamese fluently. “They were born in Vietnam but study in Laos. During summer, I sent them to their grandparents in Vietnam to study Vietnamese,” she said. The deep-rooted sentiments between the two nations have been developed. This year – 2012 – is considered as the Friendship and Solidarity Year, to celebrate the 50th anniversary of diplomatic ties between Vietnam and Laos. The two countries recently revealed the cooperation plan in 2012. Both sides agreed to popularize a project on the history of special Vietnam-Laos ties and the Vietnam-Laos combat alliance and continue to gather more evidence to complete the project. The two countries will increase the exchange of information and implement commitments within the multilateral cooperation framework, including ASEAN, the Greater Mekong Sub-Region (GMS) and the East West Economic Corridor (EWEC). They will examine Vietnamese-funded projects in Laos and sign a new investment protection and encouragement agreement to replace the 1996 agreement. Both sides agreed to hold groundbreaking and inauguration ceremonies of major joint cooperation projects invested by Vietnamese businesses to celebrate key anniversaries in 2012. They will effectively implement their trade development scheme for 2008-2015 to raise two-way trade to US$2 billion by 2015. They will complete the formulation of the Vietnam-Laos border trade development master plan and coordinate with Cambodia to soon sign the tripartite road transport agreement. At the session, both hosts and guests shared the view that in 2011, Vietnam and Laos boosted cooperation in education and training, closely coordinated at multilateral forums and reached high consensus on international and regional issues. The two countries closely coordinated in implementing Vietnamese-funded projects in Laos and increased the exchange of experiences in culture, sports, museums and other fields. By the end of March, Vietnamese enterprises had had 212 investment projects worth nearly US $3.5 billion in Laos, mostly in hydroelectricity, mining, agriculture and forestry. Mr. Tran Bac Ha, Chairman of the Association of Vietnamese Investors in Laos (AVIL), said that Vietnamese investment in Laos has increased in both project number and capital in recent years. In 2011, Vietnam had 15 investment projects worth nearly US$500 million licensed in Laos. Now, Vietnamese-invested projects are implemented in 16 out of 17 Lao provinces. Vietnam is Laos’ second biggest foreign investor.